I actually got to a model railway show this weekend – the London Festival of Railway Modelling at Alexandra Palace. Two work colleagues, who might even qualify as good friends were going, so I sent my apologies to the morning service at church and headed for Redhill station for the 7:52am train. As usual on a Sunday, there were engineering works around, so our train to Victoria took a short diversion via Balham and didn’t stop at Clapham Junction. At Victoria, transfer to the Victoria line (about the only London Underground line working due to some signalling fault) and up to Kings Cross. We had time for a coffee and to admire the new roof over the side concourse before finding our train to take us north. We had seen a charter train on the departure board, and after a few minutes a blue Class 47 came into the station with a rake of old maroon coaching stock, plus a couple of Pullmans. Aha, steam excursion, we thought. Sure enough, drawing out of Kings Cross, we saw the train was headed by a shining rebuilt West Country 4-6-2, Braunton. Ten minutes later, as we got off the train at Alexandra Palace, it occurred to us that the excursion was due to leave five minutes after us, and it would have to pass through Ally Pally. So (with a good number of other train-iacs) we waited and were rewarded by the sight of the West Country passing through the station at a steady pace. 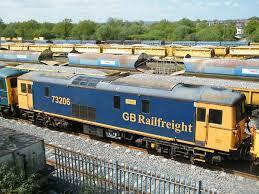 It took me back to the last days of steam on British Railways…. After this excellent start to the day, we walked up the hill to Alexandra Palace, and got on with the real business of the day. The Ally Pally show is one of the larger annual events in the UK, and this year had about 40 layouts, numerous traders, and a lot of society and demonstration stands. I attended this show last year (in the snow and ice, I recall, rather than today’s sunshine). 2014 seemed to have less stands – things were quite well spaced out – but the quality of exhibits seemed higher. There were the usual selection of British branch line layouts, but really these have been overdone over the years, and although very well modelled, fail to inspire. So what were the interesting layouts? Some very well conceived ‘O’ gauge layouts, including St Marnock, a small Scottish loco shed in British Railway days, and Oldham King Street Parcels, a small station and parcels depot. The latter appealed as it is modelled on a brick arch embankment – as a South London boy, trains belong on the top of brick arches. Well modelled European prototypes including Swiss, Austrian and Spanish layouts. Heculanem Dock in OO, a Liverpool docks layout that included the Liverpool Overhead Railway – and a ladybird that was crawling along the dock, having made guest appearances on cranes on the previous day. Overlord, with almost more ship and military models than OO trains, representing a loading point for the 1944 D-day landings. An excellent HO USA modular layout, the RS Tower. In 2mm and N gauge, there were some very good layouts. Lambourn is in 2mm scale and is some 30 years old. The layout itself still looks good, a tribute to Martin Allen’s original work, but the trains were more recent models. 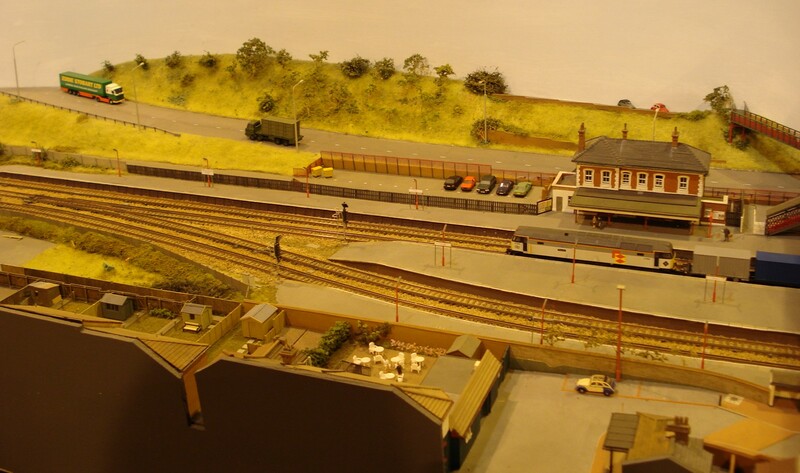 Bevois Park and St Denys models a near scale half mile of main line, the prototype being just outside Southampton. This was of great interest to one of my colleagues, who was brought up half-a-mile away. Finally, Dawes Creek models Victoria, Australia in the 1980’s. 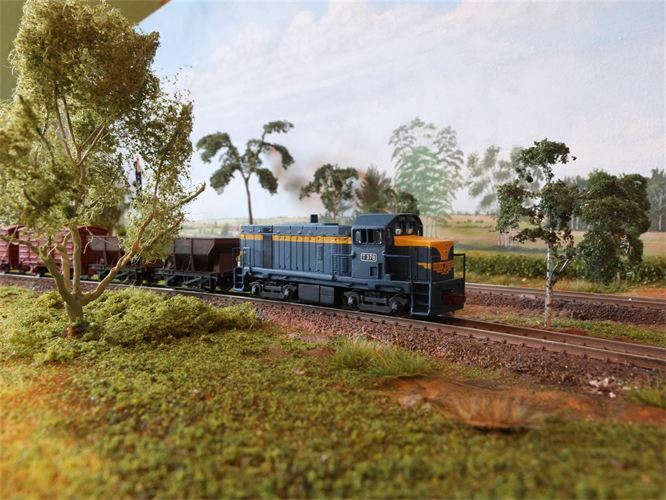 Nice to see something a little difference, and the model stood out with its ‘down-under’ scenery and a very well pained backscene with the low horizon characteristics of flat countryside.